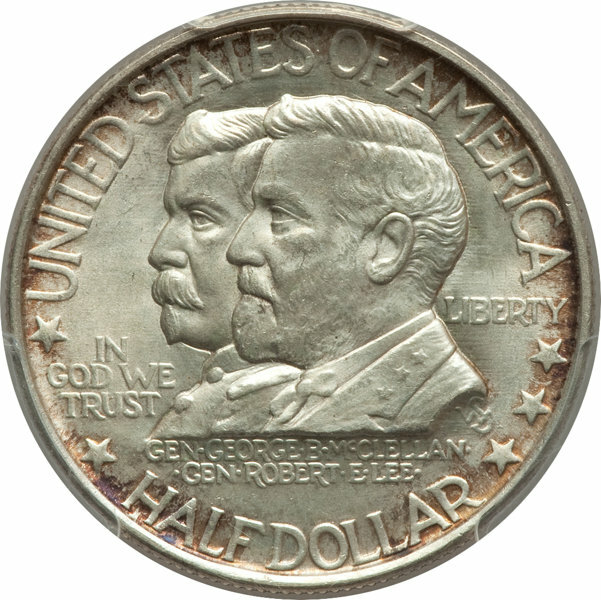 The classic commemorative coin era in the United States spans from 1892 through 1954 and both began and ended with the production of special silver half dollars. The first commemorative coin the United States Mint ever released was the 1892 World’s Columbian Exposition half dollar marking the arrival of the grand event in Chicago that drew millions of people from all over the world. Production of the Columbian half dollar was continued into 1893 and also complemented with the appearance of the 1893 World’s Columbian Exposition Isabella quarter, featuring Queen Isabella I of Spain. The next commemorative issue was the 1900 Lafayette dollar featuring on its obverse a jugate bust of George Washington and Marquis de Lafayette, with proceeds from the sale of the dollar (sold for $2 each) going to the Lafayette Memorial Commission to erect a statue in Paris as a gift from the American people. Following a brief hiatus in the production of silver commemoratives came a bevy of half dollars, beginning in 1915 with the issuance of the Panama-Pacific International Exposition commemoratives. The US commemorative program produced a flurry of issues during the 1920s and especially the 1930s, with as many as 20 distinct commemorative half dollars issued in 1936 alone. Claims of financial abuses concerning proceeds from the sale of the commemorative half dollars brought this colorful chapter of United States numismatics to an end in 1954, with the release of the last George Washington Carver/Booker T. Washington commemorative half dollars. Many silver commemoratives are common and readily obtainable in gem grades, with a few exceptions. These include the relatively scarce 1915 Panama-Pacific, 1922 Grant Memorial with Star, 1925 Fort Vancouver, 1928 Hawaiian Sesquicentennial, 1935 Hudson (New York) Sesquicentennial, and 1935 Old Spanish Trail, 1936 Battle of Gettysburg Anniversary, 1936 Norfolk (Virginia), 1937 Battle of Antietam Anniversary, and 1938 New Rochelle (New York) 250th Anniversary half dollars. The 1900 Lafayette silver dollar is scarce across the board with uncirculated specimens easily ranging into four-figure territory or higher.